Humankind is confronted with an enormous and perplexing riddle. We’ve developed a way of life that is ecologically super-idiotic (but look at our awesome phones! ), and pounding the vitality of the natural world (and soon we’ll have self-driving cars!). The great riddle is how did we get into this mess? Can we get out of it? Who are we? Where did we come from? Many books reveal important clues. Bonobo described our closest living relatives, a species that has remained sustainable for millions of years. The Art of Tracking revealed our ancient roots as bipedal hunters and scavengers, which kept our ancestors alive for several million years. Hunters of the Recent Past examined the communal hunting practiced by Homo sapiens who struggled to adapt to living in temperate and subarctic climates, during the last 15,000 years or so. Now, I want to peek at life from 40,000 to 20,000 years ago. This peek looks at the Homo sapiens who had recently moved into Europe — the ancestors of many white skinned folks who are reading my words in English. In those days, Europe enjoyed an astonishing abundance of wildlife. Peek at the fantastic cave paintings of Chauvet or Lascaux. For my tropical primate ancestors to survive in a challenging non-tropical climate, they had to live like moon explorers, with weatherproof shelters, warm clothing, blazing hearths, and a well-stocked food locker for the deep freeze months. The giant hyenas, cave bears, cave lions, and saber-tooth cats refused to join PETA, and took great delight in brutally killing the delicious primates in fur coats. Eventually, groups that were clever and lucky figured out ways to exist for a while, riding a scary climate change roller coaster. At the Roche de Solutré site, near Mâcon, France, archaeologists have found the remains of up to 100,000 horses. Prior to 1866, when experts realized the bones were prehistoric, local farmers had been hauling them away for many years, using them for fertilizer. In some places, the surface of the ground was paved with ancient horse bones. The valley was a common route for the migrations of animal herds. In the summer months, herds grazed at higher elevations to avoid heat and insects. Winter months were spent grazing on the warmer floodplain of the Saône River. The bone beds were located fairly close to the bottom of a steep limestone cliff. For years, folks theorized that the horses had been killed by driving them over the edge. At this site, a more likely scenario was that hunters drove the animals into natural rock corrals, or box canyons, where they were trapped. Once cut off from escape, they were killed, butchered, dried, and smoked. Wild horses were extremely dangerous prey. Big strong stallions would aggressively attack hunters, and stomp them to bloody bits. The oldest bones are 55,000 years old, horses killed by Neanderthals. They were covered by six feet (1.8 m) of sterile soil. The next layer is deep, containing the remains of animals killed by Homo sapiens between 37,000 and 10,000 years ago. Prior to 22,000 years ago, the majority of bones were horses. After that, reindeer bones were dominant. This was an era of climate shifts. Předmostí is near the city of Přerov, in the Czech Republic. It is located at the southern end of the Moravian Gate, a narrow corridor that passes between the Carpathian Mountains to the east, and the Sudeten range in the west, linking southern Poland and Moravia. It has long been a strategic trade and communications route. Naturally, it was also a route for the seasonal migrations of game animals in the Pleistocene, including mammoths. Předmostí has the largest mammoth bone accumulations in central Europe. The skeletons of more than a thousand have been uncovered so far. 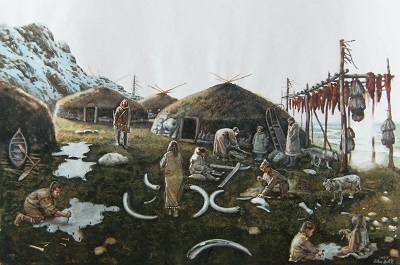 Mammoth bones were used in the construction of their huts. Excavations have found hearths, a cemetery, stone and bone tools, and carvings made from mammoth ivory. One carving has been named the Venus of Předmostí. Folks inhabited Předmostí between 27,000 and 25,000 years ago, and again later, about 20,000 years ago. During this time period, at many locations in central Europe, numerous Venus figurines have been found. HERE are some examples. The figurines inspired archaeologist Marija Gimbutas to imagine a paradise of goddess worshipping people that preceded the dark arrival of patriarchy and bloody warfare… a pleasant dream. Dolní Věstonice and Pavlov are small neighboring villages north of Mikulov, in the Czech Republic. In the twentieth century, when a villager decided to dig a cellar, he discovered the remains of a large dwelling built with mammoth bones and tusks. Multiple excavation sites in these villages have revealed fascinating details about Pleistocene hunters, who lived there from 29,000 to 24,500 years ago. They lived on terraces overlooking the river, where they had an excellent view of the vast treeless steppe below. These huts were common in central Europe. HERE is a map of them, and HERE are many images of mammoth bone huts. At one camp, four huts were located close together, and the small settlement was surrounded by a low wall made of mammoth bones and rocks, covered with brush and turf. The huts were something like teepees, covered with animal skins. They had a circular foundation made of rocks and heavy bones. Between the huts was a large outdoor fire pit. Up the hill was a small hut containing a kiln for baking clay. This is the earliest evidence of making ceramics (they did not make pottery). They created a variety of figurines, including the heads of bears, foxes, and lions, and female figurines with bulging breasts and buttocks. These may be the earliest art. At a nearby location, the largest lodge was 50 feet long (15 m) by 20 feet wide (7 m), and had five hearths. At one hearth, two long mammoth bones were stuck in the ground, to support a roasting spit. Southeast of the lodge were piles of bones, including about 100 mammoths, mostly young. There were also bones of horses, reindeer, hares, wolves, and foxes. At one dig, they found the remains of a child wearing a necklace with 27 fox teeth. The skull was covered with red ochre, and the body was covered with the shoulder blades of mammoths. Artists have studied the skulls found in the area, and made paintings of what the people would have looked like in life. When exhibited in Prague, the portrait of a prehistoric wild woman embarrassed the public — because she looked too modern, not like a dirty primitive beast — she looked like the proper and dignified ladies in the gallery (gulp!). Many awesome paintings can be found HERE. The Pleistocene epoch spanned from 2.6 million years ago, to 11,700 years ago, and it included many intense ice ages. At the end of the Pleistocene, there was a surge of extinctions; a large number of megafauna species vanished in North America, mostly between 12,000 to 10,000 years ago. Some experts blame humans for overhunting, others blame climate change, and many blame a combination. In Europe, fewer extinctions occurred, and they took place over a longer period of time. Many of the species that went extinct were giant-sized, compared to their modern relatives. Cave bears and European hippos vanished around 24,000 years ago — both species had been around for over a million years. Homotherium, a genus of saber-tooth cats, existed for five million years before vanishing 28,000 years ago. European cave lions vanished 10,000 years ago, after 1.9 million years. Cave hyenas were gone by 11,000 years ago, after 3.5 million years. Irish elk were gone by 8,000 years ago, after 400,000 years in Europe. Woolly mammoths were gone by 14,000 years ago, after 400,000 years. Woolly rhinoceros vanished 10,000 years ago, after 3.6 million years in Eurasia. Was the Great Leap Forward a great booboo? Did overhunting encourage the emergence of agriculture and civilization? Should we have stayed in tropical Africa, and skipped our nightmarish experiment in technological innovation? Why don’t bonobos need psych meds? Good luck with the riddle! Have a nice day! Image at top by Libor Balák. Fagan, Brian, Cro-Magnon: How the Ice Age Gave Birth to the First Modern Humans, Bloomsbury Press, New York, 2010. Svoboda, Jiri, and Vojen Lozek, Hunters Between East and West: The Paleolithic of Moravia, Springer Science, New York, 1996. HERE are paintings of life in central Europe from 20,000 to 12,500 years ago. HERE is a large collection of photos and random notes describing the Kostenki sites along the Don River in Russia. Kostenki is notable for the mammoth bone huts found there. HERE is a large collection of interesting photos, maps, and random notes describing the Dolní Věstonice and Pavlov sites in the Czech Republic. When I hear the word “hunter,” I immediately conjure an image of a man with a gun. Other images follow — bows and arrows, mounted hunters, cavemen with spears, and so on. Hunters of the Recent Past provided me with much new information on how the ancestors lived, prior to horses, guns, and other industrial gizmos. The book is a collection of 19 scholarly papers that describe modes of low-tech communal hunting that were common during the last 8,000 years or so. Evolution fine-tuned our species for life on tropical savannahs. In a hot climate, meat spoils quickly, so hunting was only done to satisfy immediate needs. Tropical folks could survive without fire and clever technology. On the other hand, in temperate and subarctic climates, the buffet of food resources was less generous. In many regions, survival through long winters was impossible without having fire, warm shelter, fur clothing, and substantial amounts of stored food. On the western plains of North America, a common method of communal hunting was driving herds of buffalo off cliffs. White folks called these killing sites buffalo jumps, the Blackfeet called them pishkuns. Pishkuns were scattered from Canada to Mexico. There were more than 300 in Montana alone. For thousands of years, prior to horses and guns, this was a primary method for hunting buffalo. At the First Peoples Buffalo Jump State Park in Montana, many layers of buffalo bones are found beneath the cliff — literally millions of bones. In the journal of the Lewis and Clark Expedition, Lewis noted that on May 29, 1805 they discovered the rotting carcasses of about 100 buffalo at the bottom of a cliff, as well as great numbers of well-fed wolves that were “very gentle.” For amusement, Clark felt inspired to shoot one of the blissed out wolves. There were two primary seasons for communal hunting, springtime and late autumn/early winter. In spring, little stored food was left. Buffalo still had heavy winter coats, excellent for making warm clothing. In the fall, animals had fattened up for the long cold winter, and fat was cherished. Animals with minimal fat were junk food, or dog food, or left to rot. Reindeer live in northern Eurasia, and caribou live in Greenland, Canada, and Alaska. The two creatures are the same species (Rangifer tarandus), but there are nine subspecies, like tundra reindeer, woodland reindeer, tundra caribou, woodland caribou, etc. Several are now endangered. The species is unique in that both sexes grow antlers. All around the Arctic Circle, reindeer and caribou have been hunted for thousands of years. They provide meat, sinew for sewing, bone for needles and awls, antler for tools, fat for light, heating, and nourishment, and hides for bags, snares, clothes, and tents. They make survival possible. Every spring and fall, herds made seasonal migrations along traditional routes. Hunters knew when and where to expect them. These routes often had bottlenecks that concentrated the herds, ideal locations for hunting. Commonly, groups of hunters would drive the herds into killing places. To direct the movement of a herd, drive lanes included barriers — log fences, brush fences, snow drifts, rock cairns. Some locations had corrals of wood or stone to capture the herd. In Siberia, animals were driven into nets. Herds were driven into deep snow and then lanced or shot with arrows. In Greenland, caribou were driven off cliffs. Some hunters used snares, open loops suspended from branches, to grab animals by their necks or antlers. Snares were placed along game trails, where animals voluntarily moved, or scattered along drive lanes where hunters or dogs aggressively drove them. Records from 250 years ago report that near Churchill, Manitoba, caribou herds were driven into corrals that were one mile (1.6 km) in diameter, and 350 to 600 people participated in the kill. The easiest method, where possible, was to drive the herd into streams or lakes, where they were lanced by hunters in canoes or kayaks. Two hundred animals could be taken in a few hours. During a two-week summer hunt on Lake Mistinipi, hunters speared 1,200 to 1,500 caribou. One Copper Inuit settlement, inhabited between 1500 and 1700, was located close to a caribou migration route. During two centuries, an estimated 100,000 caribou were driven into the lake and killed. Lads in canoes did not always stop killing when they had all the meat they needed. In a frenzy, they killed as many caribou as they could, the entire herd, if possible. It was a great pleasure to kill so easily, many months since the last migration. Near Hudson Bay, an observer in the 1890s found hundreds of carcasses left to rot — overkill. In Scotland, Norway, Sweden, and Finland, many thousands of pit traps were dug in migration routes to catch reindeer. Animals could be driven into the pits during their outbound and inbound migrations. In southern Norway, trapping pits were used as early as 11,000 years ago. HERE are examples of snares and traps used in Stone Age Finland. HERE are photos of recreations of a settlement in Stone Age Finland. Caribou herds had been following traditional migration routes for 8,000 years or more. Indians and Inuit built permanent settlements along the routes. In the nineteenth century, when hunters began using repeating rifles, animals could be killed from farther away, requiring less stalking skill. The caribou harvest sharply increased. Before long, herds abandoned traditional routes, communities starved, and their settlements went extinct — an unintended consequence of progress. The book also discusses communal hunting for pronghorn antelope, mountain sheep (bighorns), mammoths and mastodons, moas, guanacos, and others. It’s a mother lode of information. The writing is scholarly — terse and compact — but not bewildering techno jargon gibberish. Compared to the good old days in mother Africa, it was far more difficult for tropical primates to survive in cool climates. The selection of kill sites, and the construction of drive lanes, corrals, and pit traps was a major effort. On the days of mass kills, large numbers of people were required for success. Preserving meat and hides took weeks of work. Communal hunting required teamwork, planning, and extensive knowledge of the landscape, the behavior of animals, and basic survival. Over time, it contributed to the extinction of mammoths, mastodons, and moas. By the 1930s, mountain sheep were nearly gone. With the arrival of guns, horses, traders, snowmobiles, ranchers, loggers, miners, diseases, and genocidal maniacs, the herds of buffalo, caribou, and reindeer have been sharply reduced. In another review (HERE), we learned that the persistence hunters of the Kalahari, and their hominid predecessors, remained extremely low tech for two million years or more. The civilized people who have waged full-scale war on wildlife are all descendants of persistence hunters. Technological innovation is demonically addictive, new gizmos replacing old, in an accelerating downward spiral. Cultures bewitched with cleverness gallop down the drive lanes, faster and faster and faster, destined for the bloody bone beds below — big brains and all. There are other paths. 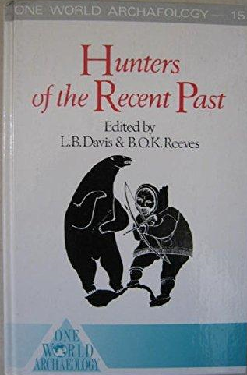 Davis, Leslie B., and Brian O. K. Reeves, editors, Hunters of the Recent Past, Unwin Hyman, London, 1990. For at least four million years, our ancestors have been bipedal, they moved around on two legs. This ability evolved on the African savannah, tropical grassland. Being upright exposed less of their bodies to hot sunbeams, and their bushy head hair provided extra protection. Their nearly furless bodies, combined with three million sweat glands, allowed them to shed body heat better than other savannah mammals. Being bipedal prohibited lightning fast bursts of speed, but it enabled steady long distance running in roasting temperatures. Other mammals could make quick getaways, but they soon had to find shade and chill out. Our ancestors were able to chase large animals in the heat of the day, hour after hour, until their prey collapsed from exhaustion or heat stroke. The person you see in the mirror has a body that is optimized for running, not walking. Your toes and heel tendons provide a bounce when your foot hits the ground, improving energy efficiency. Your legs and spine are fine-tuned for jogging, keeping your head and eyes steady. Skilled runners seem to move with elegant smoothness, effortlessly gliding along, lightly skimming across the land. As I learned more about long distance running, I kept discovering fascinating tidbits about persistence hunting. Aborigines would eventually outrun kangaroos. The Penobscot tribe chased down moose, and the Navajo and Paiutes would subdue antelopes. The Tarahumara pursued deer and turkeys. In Southern Africa, game included steenbok, gemsbok, wildebeest, zebras, and others. Peter Nabokov’s book, Indian Running, blew my mind. In 1680, Spaniards had been building missions in the region for 90 years, and they displayed remarkable gifts for behaving like class-A tyrants. Natives from up to 300 miles (483 km) away coordinated their attack to expel the illegal aliens, and defend the American way of life. Churches went up in smoke, their hated bells were smashed, documents were burned, 21 detested priests were sent to their just rewards, along with 380 of their Spanish and Mexican Indian associates. Good triumphed over evil (for 12 years). Joy! The outline of Nabokov’s book includes five chapters that provide commentary on the five days of the 1980 race. Throughout the text, he inserted passages about other tribes and eras, with regard to running, and these passages include some mind-altering gems. By the end of the book, my perception of what it means to be human had been significantly updated and clarified. Every morning, I step outdoors and wince at the rumbling thunder of thousands of motorized wheelchairs. We consider this normal, but limited energy reserves guarantee that this silliness can have no long-term future. When the last Toyota croaks, an extremely bloated population is not going to return to travelling by horse. By the 1890s, industrial cities had become filthy, stinking, unhealthy nightmares of horse manure, urine, and thick clouds of flies (read THIS). A mere 5,500 years ago, horses were domesticated in Kazakhstan. Like the atom bomb, this event radically altered the course of the human saga. With horses, the ferocious Mongols rapidly created the biggest contiguous empire in all history. Mounted warriors dominated warfare for centuries, until guns and cannons came to the battlefield. Plains Indians didn’t acquire horses until the eighteenth century, at which point their way of life promptly experienced turbulent changes, but that’s another story. Nabakov’s story is about running. For essentially four million years, running meant survival. A Hopi man said, “Long ago when the Hopi had no sheep, no horses, no burros, they had to depend for game-capturing on their legs.” Running was also vital during conflicts — for chasing despised enemies, and for speedy exits when despised enemies came to visit. Running could be crucial for escaping the claws and jaws of man-eating predators, and other bummers. He noted that many civilizations used runners to deliver messages — Greeks, Romans, Chinese, Persians, Aztecs, Incas, Mayans. With fresh runners ready at stations placed several miles apart, messages could move through the Inca world at 150 miles (241 km) per day. In Greece, the “marathon” race refers to 490 B.C., when a soldier ran 25 miles (40 km) from Marathon to Athens, bringing news of the Athenian victory over the Persians — and then he collapsed from exhaustion and died. Nabokov provides numerous accounts of Indian messengers traveling great distances. One ran 50 miles in six hours. A Mojave lad ran 200 miles (322 km) in 24 hours. Seven days a week, a Tarahumara man ran a 70 mile (112 km) route, carrying a heavy mailbag. Another report noted that some Tarahumara lads could run 170 miles (273 km) without stopping. Mexicans would hire them to capture wild horses, chasing them for two or three days, until the horses could run no more — while the men remained fresh. After running 15 miles (24 km), Zuni runners still had a slow heart rate and no signs of fatigue. Men in their seventies continued to have tremendous endurance, as well as low blood pressure. Ceremonial running was done after planting to bring rain, and ensure a good harvest. For Navajo and Apache women, a four-day rite of passage ritual was held to honor their first menstruation. Young ladies would run each day, to become strong in body and soul. Many other tribes practiced forms of puberty running. When he was just four years old, Navajo lad Rex Lee Jim was awakened before sunrise each day, and sent outside to run four miles before breakfast. In winter, he might take a freeze bath, rolling in the snow before running. Geronimo and the Apaches were infamous bad asses. By the age of 8, boys were being taught to increase their strength, endurance, and tolerance of pain. They ran up mountains. They ran carrying loads. They punched trees. Apache warriors were far stronger and tougher than the U.S. cavalry soldiers sent to exterminate them. I spent many years sitting indoors in school desks, learning reading, writing, and arithmetic, loading my brains with the ideas necessary to be an obedient, punctual, productive cog in the industrial society that’s pounding the planet to pieces. Wild Native Americans, during the years of their youth, were being taught to be strong, brave, and extremely healthy. They learned the skills needed to survive in their ecosystem, in a low impact manner. During their entire lives, they sent nothing to landfills. In the Boston Marathon, participants are running for themselves, individuals in a vast mob of folks motivated to beat records and gain fame. When Indians run in races, they do so as members of their tribe. They have a sense of belonging, of community, of one enduring culture, that white people never experience. When natives run, the message is about peace, harmony, and uniting as a people. Race time is not important. Fame tends to result in bigheads bloated with pride, an unwelcome irritant in tribal communities. Excellent native runners are more likely to pump gas than become famous celebrity athletes on national TV. There’s no place like home. Nabokov, Peter, Indian Running, 1981, Reprint, Ancient City Press, Santa Fe, New Mexico, 1987. For more info on running and tracking, see my two previous reviews, The Art of Tracking, and The Origin of Science. 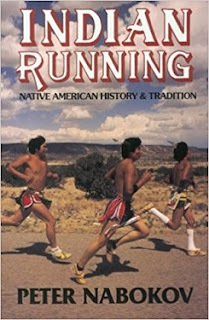 Other interesting books include Why We Run, by Bernd Heinrich, and The Tarahumara, by Wendell Bennett and Robert Zingg.